Eee PC 900 solid state disk: Not as fast as Eee PC 701? For the most part, the Eee PC 900 is identical to the Eee PC 700 series, except it has a larger, higher resolution screen and more memory, right? Well, there are a few other significant differences under the hood. For example, Asus packed two solid state disks into every Eee PC 900. There’s a 4GB SSD for the operating system and program files, and an 8GB or 16GB SSD for extra storage (the 8GB disk comes with the Windows XP version, while you get a 16GB disk if you buy the Linux model). 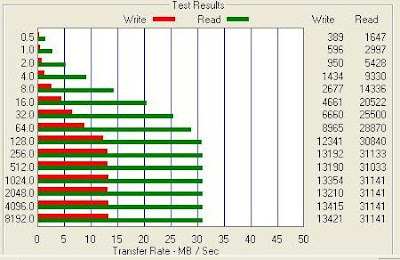 The 4GB SSD in the Eee PC 900 seems to be the fastes of the bunch. The 4GB/8GB SSD in the 700 series comes in second (The 8G model is actually installed in a PCI-E slot, not soldered to the motherboard, and seems to have a faster read speed than the 4GB, but a slower write speed). The 8/16GB SSD in the 900 series comes in a distant third. If you have an Eee PC 900, you can certainly wipe the operating system from your 4GB SSD and install it to your 8/16GB disk if you want to. But these results show that the 4GB SSD read/write speeds are significantly quicker. So you’re probably better off installing any operating systems to that disk. Which is probably fine if you only have one OS on your computer. But if you want a dual or triple boot system it would be nice if the 8/16GB disk was a bit quicker so you could comfortably install an OS to that drive, leaving room for your initial operating system to breathe on the 4GB SSD.